Hailey and I chatted one afternoon in May about her Peace Corps experiences in Niger and Senegal. Listening to her story, it struck me that having served in a rural community in Niger, and then serving in Dakar during her third year, Hailey got to have the best of both worlds in terms of Peace Corps experiences. She was able to have that rural village experience, which is what you would typically think of when you think of the Peace Corps. At the same time, she was able to really build up her professional experience, working with an NGO during her third year. As always, every Peace Corps experience is unique, and Hailey’s experience is an example of that. Hailey served in the Peace Corps first in Niger from October 2008 – January 2011 and then she extended her service to work with Helen Keller International in Senegal from January 2011 – 2012. After completing her service, Hailey returned to her hometown of Seattle, WA to pursue a career in global health. She currently works at PATH, an international nonprofit organization, supporting various maternal health and reproductive health projects. Hailey has continued to feed her passion for learning about new cultures though experiencing world cuisines, dance, and travel and her involvement with the World Affairs Council. I really enjoyed talking with Yoomie and hearing her story. Coming to the US as a refugee from Vietnam, it was interesting to hear about her experiences growing up as an immigrant in the mid-West. I liked how determined and driven she was, and her story really epitomizes the idea of the “American Dream.” For Yoomie, joining the Peace Corps was a way to give back to a country that had afforded her so many opportunities, and also to help people in other countries who may not have the same opportunities as her. What an inspiring story! Ms. Yoomie Huynh has eight years of international development experience concentrating in social protection work with local grassroots NGOs, international non-profits, and inter-governmental organizations; five of which were in Mongolia, Thailand, Cambodia, Tajikistan, and Georgia. She specializes in human trafficking, child labor, gender issues, migrant populations, social protection, and reintegration programs. 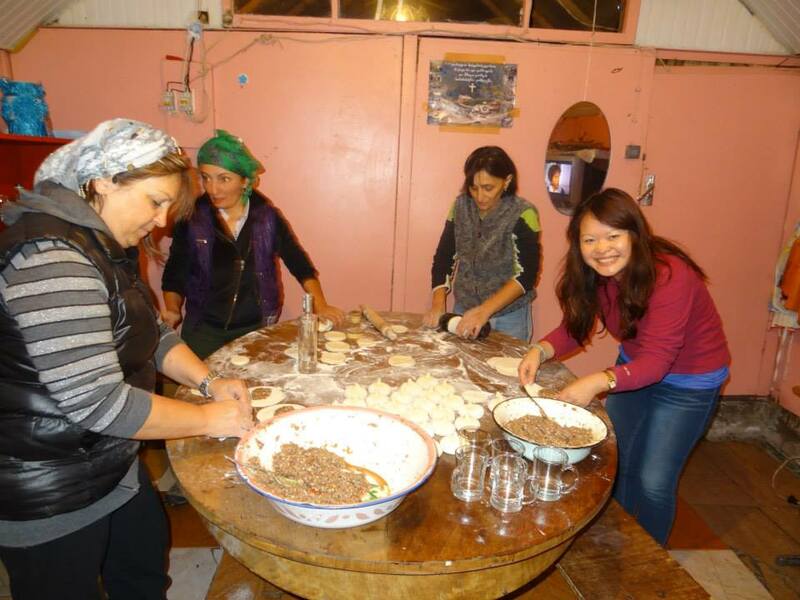 She served as a two-year Peace Corps volunteer in Mongolia from 2007-2009 as a Community Youth Development (CYD) volunteer at an orphanage in Darkhan, Mongolia. Additionally, she recently returned from a 6.5 month stint as a Peace Corps Response volunteer as a Youth Program Development Consultant for the Children and Youth National Center (CYNC), Ministry of Sports and Youth in Tbilisi, Georgia. She holds a BA in Psychology, Theology, and Women Studies from Georgetown University and an MSc in Violence, Conflict and Development from the School of Oriental and African Studies (SOAS), Univeristy of London. Yoomie is from Binh Duong, Vietnam and Sioux City, Iowa. I have known Jason for about five years, so I was excited to have the opportunity to talk with him about his Peace Corps experience. It’s always fun to exchange Peace Corps stories with a friend. Jason and I talked about the interesting journey he took to get to where he is today – starting out in IT, working in environmental education in the Peace Corps, and finally ending up as a public health professional in Seattle. I like how his story doesn’t really follow a linear path, and the many adventurous leaps he’s taken along the way. That’s something I aspire to have in my own life. Originally from Richmond, VA Jason worked in IT and the dotcom scene of San Francisco prior to heading off to East Africa with the Peace Corps. He served as an Environmental Education volunteer in Palangawanu, Tanzania from 2002-04. It was there where he learned to appreciate the dynamics at play within communities and the inherent challenges confronted in a rapidly changing world. He experienced firsthand the advent of the cellphone and its dramatic impact within Palangawanu. He continues to try and address challenges in access to health care through the utilization of eHealth and improved community health programs through his work at PATH. He focuses on maternal and newborn health, TB, HIV/AIDS, malaria, nutrition and water and sanitation programs throughout sub-Saharan Africa. Following his time in the Peace Corps he's lived in New Zealand, Uganda and South Sudan and worked extensively in Zimbabwe, Madagascar and Ghana. He's thrilled to now call the Pac NW home, but enjoys his opportunities to travel back to Africa. To commemorate our one year anniversary of this podcast, I wanted to showcase the writing and music created by RPCVs and inspired by their Peace Corps experience. I invited past podcast guests, Steve Latin-Kasper and Ryan Weber to share with us songs that that they wrote. I also invited poet and Romania RPCV, Clela Reed, who shared her poetry that she wrote during her time in Romania. I had a lot of fun putting this episode together, and it really highlighted for me how Peace Corps is more than just service and cultural exchange. It can also be a very deep and personal journey. Steve Latin-Kasper served in the Peace Corps in the Marshall Islands from 1981 to 1983. While there, he played drums and sang with a band called Dri Karere Ran. Upon returning from the Peace Corps, he stopped music to pursue other interests. At the age of 54, after a decades long absence from music, Steve started a band with his friend called Boks of Rock. They self published their first album in February 2013, and are currently working on another one. Band info can be found at boksofrock.com. Clela Reed is the author of two books of poetry: "Dancing on the Rim" and "The Hero of the Revolution Serves Us Tea." She is also author of two chapbooks: "Bloodline" and "Of Root and Sky." She has had poems published in "Caesura Literary Magazine," "Colere Journal," "The Kennesaw Review," "Storysouth Journal," "Clapboard House Literary Journal," and others. A former English teacher and Facilitator for the Gifted, she is also a returned Romania Peace Corps volunteer. She lives and writes with her husband and a small herd of deer in her forest home near Athens, Georgia. Ryan E. Weber originally hails from snowy farmlands on the Western shores of Lake Michigan. He is noted for playing in indie bands such as the shoegazey-Cambden, emo pioneers-The Promise Ring, Midwestern altcountry road warriors-Decibully, spacey and sublime indie popsters-Eric & Magill and most recently creating the sparse and dreamy - REW<<. While working in both Kenya and the Republic of Armenia, Weber collaborated over the internet with a host of notable contemporary indie artists including members of Shearwater, The Dirty Projectors, Owen, Volcano Choir, and The Delgados, to name just a few. These days, he can be frequently found in subterranean tunnels waiting for Metros below the nation's capital. Steve and I had an enjoyable conversation in early March, talking about his experiences as a volunteer in the Marshall Islands back in the '80s, as well as life after coming back from the Peace Corps. One thing I liked about his story was that music played a big part in his experience in the Peace Corps. But when he returned to the states, it sort of took a back seat to life and responsibilities. It's only recently, decades after his service, that he's returned to music, releasing an album with a friend. I often think about the kinds of people that we were during our years in the Peace Corps. In a way, being in such a unique and sometimes isolating experience frees you to explore parts of you that can sometimes get lost or pushed aside in the "real world." The trick is being able to meld those two personas - the you before and during Peace Corps - and allowing all those experiences to shape who you are. Steve earned a Masters degree in Economics at the University of Utah in 1979, and started his first job shortly after as an Economic Statistician for the Bureau of the Census. He had expected to join the Peace Corps at that time, but the group he was originally supposed to go with to El Salvador was prevented from going when American nuns were murdered and Peace Corps removed all volunteers from Central America. Apparently Steve was not cut out to be a bureaucrat and one and one-half years later he decided to find out why he never heard back from the Peace Corps. During a visit to the old K Street office in DC, he found out that they had lost his file, so he reapplied. He ended up in the Marshall Islands. While in the Peace Corps from 1981 to 1983, he spent his first year a Community Developer on the outer atoll of Lae. After his group’s mid-tour meeting, he was asked to work with the Republic of the Marshall Islands Department of Development to write the country’s first 5-Year Economic Development Plan as part of the process for joining the United Nations. Upon returning home in August 1983, he found that the unemployment rate in Milwaukee was over 20%, and it took six months to find a job. He finally landed one at Astronautics in Milwaukee, and about one year later took a job with the National Fluid Power Association. Since 1999 he has worked for the truck industry. He specializes in forecasting and is a member of the forecast panels run by Bloomberg and the National Association for Business Economics. Steve had played drums and sang with a band called Dri Karere Ran while in the Peace Corps, and when he and Molli became empty nesters, he found that he missed writing music and performing. So, at the age of 54, he found the time to start a new band with his friend Bill. They self published their first album in February 2013, and are currently working on another one. Band info can be found at boksofrock.com. Ryan and I chatted via Skype earlier this month about his time in Kenya, where he served as a health volunteer with his wife. I was intrigued by his descriptions of his site, being both very removed from everyone yet connected at the same time. Although he and his wife were placed in a remote community, their house was in close proximity to a cellphone tower, which allowed them to stay in touch with folks back home. As a result, during his time in Kenya, Ryan was able to complete an online Master's degree, and record two albums with his band, Eric and Magill. I am constantly surprised at how much technology has allowed the Peace Corps experience to evolve and change, even in the eight years since I finished my service! Listen to Ryan's band, Eric and Magill at ericandmagill.bandcamp.com, and also check out Ryan's solo work at rew-music.bandcamp.com. I recently spoke with Alan Toth, a South Africa RPCV, who has just completed a documentary called "Posh Corps." The film looks at the lives of Peace Corps volunteers in South Africa, and the challenges they face as volunteers in another country. We talked a great deal about the film, but we also talked about Alan's own experiences in the Peace Corps. What I liked about Alan was that he came from a somewhat "non-traditional" background, in the sense that he didn't study international relations, or medicine, or agriculture, or any of the subjects you would typically expect from a Peace Corps volunteer. Yet somehow, he was able to use his background and combine it with his Peace Corps experience to create something for people to enjoy. Each year during the last week of February, the Peace Corps community celebrates Peace Corps Week, to commemorate the establishment of the Peace Corps by President John F. Kennedy. It seems fitting, then, that our episode this week features an RPCV who is doing a great job of promoting the Third Goal. Location scouting in South Africa. Alan Toth was a Peace Corps volunteer in South Africa from 2010 to 2012. One of the challenges of serving in Peace Corps South Africa is the extreme disparity between the "first-world" cities in South Africa, and the "third-world" villages. Most of the time, Alan experienced what most Peace Corps volunteers might consider a traditional Peace Corps experience, but development was slowly making its way even to his remote site, and he did have to go to the cities from time to time. The constant adjustment from first to third-world takes it's toll on every volunteer in the country. Alan wanted people to know the story of volunteers in a rapidly developing country. So he returned to South Africa after ending his service and shot a documentary about the lives of volunteers in South Africa. Posh Corps is a documentary that focuses on the lives of Peace Corps volunteers in South Africa. South Africa is one of the most modern countries in which Peace Corps Volunteers serve. Through the eyes of volunteers in South Africa, we discover that modernization does not necessarily make life easier. As the third-world slowly becomes the first-world, the struggles of Peace Corps Volunteers in South Africa provide a window into the struggles of volunteers throughout the developing world. Check out the "Posh Corps" trailer on Vimeo or visit Alan's website, Forgotten Archive. In honor of Valentine's Day, we bring you a Peace Corps love story! I had the pleasure of talking with Jee and David in their home in Seattle back in January. It was nice to listen to their story and hear them talk about their respective Peace Corps experiences. The Peace Corps, like many other novel and exotic experiences, has a way of bringing people together. Sometimes these connections are short lived. Other times the experience can lead to a deep and meaningful relationship. It's always wonderful to hear stories of the couples who do last, years after the experience has passed. David and Jee in front of David's house in Guatemala. Doug and I had a fascinating conversation about the early years of Peace Corps. It was also quite interesting to hear him talk about life in the 60's during the Civil Rights era. As a person who was born decades after the Civil Rights movement, most of what I know of that time period was what I read in books. This was really the first time I spoke to someone with first hand stories of being in the South in the 60's. Listening to Doug talk, I realize that although we have come a long way since the days of segregation and blatant discrimination, in terms of equal rights for everyone, we still have some work ahead of us. Track training at Cornell University, 1961. 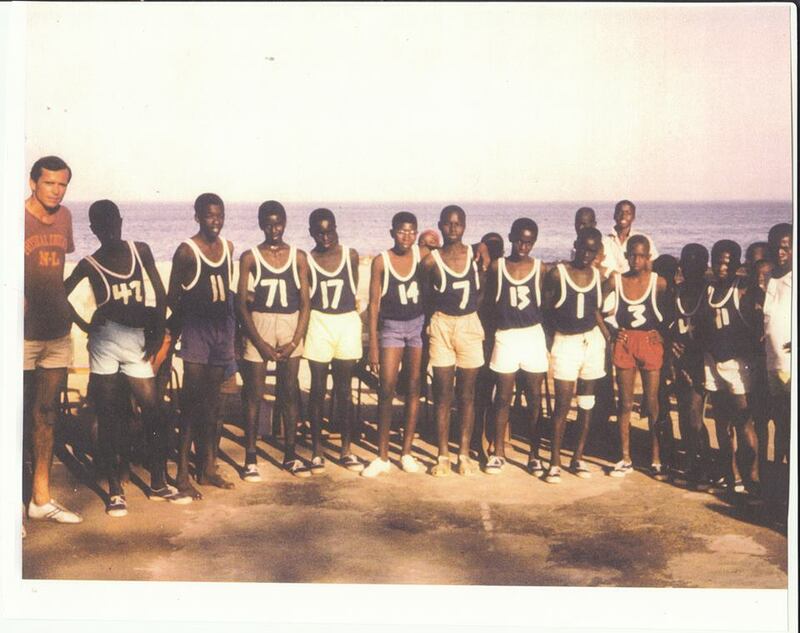 With one of his basketball team in Ile de Goree, 1963. Doug has had a long career in sales, international issues, educational administration, non-profit organizations and project management. After serving in the Peace Corps, he worked for the agency as a recruiter. Doug has held leadership positions at universities such as Cornell Univeristy, University of California - Santa Cruz, and Creighton University. His leadership skills also extend to non-profit organizations such as The International Rescue Committee and the Chemung Valley Arts Council. Doug has an MA from Northern Michigan University in Sociology and Education, and has also completed graduate work in Cultural Anthropology and Education at the University of Nebraska. He currently lives in Edenton, North Carolina. When I first heard about the upcoming documentary, 27 Months, I knew that we had to get someone from the film on our show. This film follows three Peace Corps volunteers during their service, and focuses on the transformation that occurs during those 27 months. Although Ashley, the director of 27 Months, did not actually do the Peace Corps, her experience making the documentary gave her a lot of great insight into the Peace Corps experience. I had a wonderful time chatting with Ashley about her process in making the documentary, and also learned a lot about what it takes to bring a project such as this into fruition. In a way, her film project is a perfect example of a Peace Corps project - working with little to no resources to create something that is powerful and amazing and meaningful. I'm excited to see how the film turns out. Spending some down time in the Philippines. Ashley Archer Tindall produces educational videos for Stanford University and Sheryl Sandberg's leadership organization LeanIn, and independent directors. She has worked as an Associate Producer for National Geographic TV and Earth Island Institute's Sacred Land Film Project, directed research for HBO's Rolling Stones documentary "Crossfire Hurricane," and was Assistant Director on Sea Studios Foundation's innovative "Otter 501" hybrid film. She holds Masters degrees in Documentary Film from Stanford and in Public Policy from UCLA. She received her BA from the University of Chicago in Literature and French. Check out the film on Facebook or follow them on Twitter. Watch the trailer for the film at Vimeo.com.